Charlotta Krispinsson is a visiting postdoctoral researcher. She earned her PhD in Art History at Stockholm University in 2016. Her doctoral thesis is entitled Historical Portraits as Documents: Collections, Archives, Art Historiography (Nordic Academic Press 2016). It is a study on the reception history of early modern portraiture as expressed in art historiography 1880-1945. It is also the first study on the transnational museum history of National Portrait Galleries in Europe. 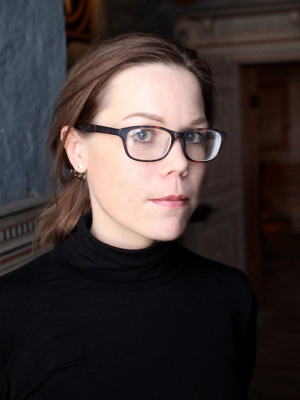 Krispinsson’s current postdoctoral project is entitled “Early Modern Copying and Replication: Image, Medium, Practice”. It addresses practices of manual copying and replication as a cultural technique and copying considered as the reciprocal and transmedial circulation of images between different media. The project includes three main studies on the workshop of the Livonian painter and guild alderman Johan Heinrich Elbfas in Stockholm ca 1630-50; complexities and contradictions in the early modern conceptual history of “conterfei”; and early modern painterly practices of copying. Research interests: art historiography and the material history of research practices within art history, image theory, Kulturtechnik, museum history, and theories on portraiture. Historiska porträtt som kunskapskälla: Samlingar, arkiv och konsthistorieskrivning, Nordic Academic Press, Lund 2016. ”Collecting Faces: Art History and the Epistemology of Portraiture. The Case of the Swedish Portrait Archive”, Sensorium Journal, no. 1, 2016. ”Aby Warburg’s Legacy and the Concept of Image Vehicles. ”Bilderfahrzeuge”: On the Migration of Images, Forms and Ideas. London 13-14 March 2015”, Konsthistorisk tidskrift, vol. 84, no. 4, 2015. ”Collection BIOMUS / Museum Fantasies”, How to gather? Acting in a Center in a City in the Heart of the Island of Eurasia, exh. cat., Moscow Biennale Art Foundation, Moskow 2015. “The Challenge of the Object. CIHA:s (Congrès International d’Histoire de l’Art) 33:e internationella kongress för konstvetare. Nürnberg 15–20 juli 2012.”, Konsthistorisk tidskrift, vol: 81, no. 3, 2012. 10/2017 “Images of Learned and Great Men: Admiration and Secular Idol Worship as Aesthetic Experience”, Aesthetic Experience in Early Modern Cultures, the Royal Swedish Academy of Letters, History and Antiquities, Stockholm. 09/2017 “Portraiture as Eyewitnessing in Art Historiography from 1885 to 1930”, ‘On the Spot at the Time’: Eyewitnessing and Authenticity in the Visual Arts, c. 1800-2000, Justus-Liebig-Universität Gießen. 09/2017 “In the Presence of Great Men: The German National Portrait Gallery 1913-1933”, Art and Presence, University of Southern Denmark, Odense. 08/2017 “Das Bildnis in der Kunstgeschichtsschreibung und in der kunstwissenschaftlichen Forschung”, Das Bildnis zwischen Staatsporträt und Selfie, Alfred Toepfer Stiftung F.V.S., Seminarzentrum Gut Siggen, Oldenburg. 03/2017 “The Afterlife of Early Modern Portraiture in Digitized Museum Collections: Discovering Conventions and Forgotten Images.” Digital Humanities in the Nordic Countries, Gothenburg University. 09/2015 “Collecting Faces: Art Historians and the Epistemology of Portraiture. The Case of the Swedish Portrait Archive.” A Medium is a Medium is a Medium, Linköping University. 05/2015 Head of Session: “Expanding Perspectives in the Study of Art Historiography.”, The 11th Triannual Nordik Committee for Art History Conference: Mapping Unchartered Territories, University of Iceland, Reykjavik. 04/2015 “The Concept of Iconography before Panofsky.” Reconsidering the Origins of Portraiture, Jagellionian university, Cracow. 10/2013 “Sixten Strömbom and the Images of Gustavus Adolphus: Affective Encounters.”, Metahistories, Stockholm University. 10/2012 “Making History Present: The Display of National Portrait Collections at Castles.” The 10th Triannual Nordik Committee for Art History Conference: Presentation/Representation/Repression, Stockholm University.